CMMI was created by the Affordable Care Act to fund the development of new models of payment that would ultimately reduce the costs of healthcare in the U.S., at least that portion of it paid for care delivered through Medicare and Medicaid. The initial funding for this ambitious initiative was $10 billion. CMMI developed categories of clinical models through which it thought savings could be gained, through risk-sharing and other methods. In 2016 CMS presented the most important adjustment to its payment structure since Medicare was established, declaring that it would start to reimburse providers for value, rather than fee-for-performance. The Innovation Center was created to assess, fund and underwrite payment models that serve its Medicare and Medicaid beneficiaries. Many score of models have been initiated since in recent years. But rarely have these models included integrative clinical centers or practitioners. 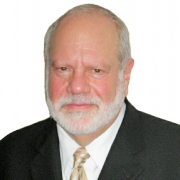 CMMI depends on stakeholders to come forward with applications for models, but because of the historic chasm between CMS and the integrative clinical community — despite its adoption by conventional systems in recent years — few integrative centers have made application to participate in its Alternative Payment Models (APM) program. This is due to the sustained uncertainty as to how even licensed practitioners who provide services that are “not usually paid for” (acupuncture, massage therapy, tai chi, yoga, etc.) can effectively participate to achieve CMS’ ambitious cost-saving programs. And that remains to be determined. The remaining and over-arching barrier that CMS can directly resolve is the inequitable status of reimbursement for services provided by state-licensed integrative providers, despite long-standing patient demand and robust clinical outcomes. The letter, signed by IHPC Chairman Len Wisneski (at right), set out the summary of the cost-effectiveness research that IHPC compiled and published in 2015, “Integrative Health and Medicine: Today’s Answer to Affordable Healthcare”. 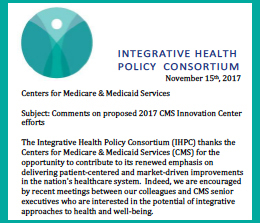 The letter also points out the important roles that integrative practitioners have assumed in primary care as the nation faces a primary care physician shortage; in group visits that Medicaid already funds; and in state innovation projects. It also requests that CMMI ensure that if necessary, integrative practitioners and clinical programs are granted waivers to ensure that payment for services is equitably distributed. In its announcement of the RFI CMS said it may or may not respond to submitted recommendations.